When English pop star Colin Radcliffe asks Alexa to write his biography and tour with him in Europe, she is thrilled—until she begins to receive death threats. 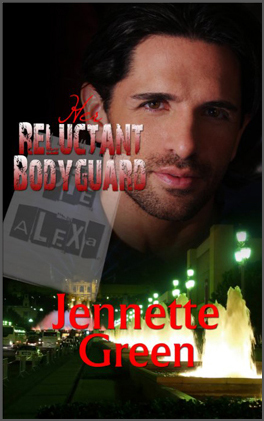 To her dismay, Colin puts her under the 24/7 protection of his Italian chief bodyguard, Jamison Constanzo—a man with whom she’s clashed from day one. If only she could spend more time with her perfect man, Colin, rather than spending all of her days with this black-hearted thorn in her side! Alexa crossed to poke her head into Jamison’s room. He’d just unzipped a giant suitcase—black, of course—and draped a clump of black, button down shirts on the bed. Some looked to be made of cotton, others of a silkier material. “Are you color blind?” she wanted to know. He pulled out a pile of black pants. Some jeans, some slacks. “Fine.” Jamison pulled a thick book from the bottomless suitcase and placed it on the bedside table. What was that? War and Peace? Certainly appropriate for their living situation. “Well then,” Alexa said, pleased. “I’ll leave you to sort your outfits by color. I’m never sure—does black silk go with black cotton?” With this saucy comment, which likely sailed right over his unfashionable head, she turned to leave. Alexa turned back. She should have known her triumph had been too easy. “I promise I won’t kill you, princess. It’s not in my job description.” How could he look so amused? “There are no words. Honestly, there are no words to explain how much I loved this book. This is probably one of the absolute best books I have ever read in my entire life. I just don’t know where to begin. “First of all, I should say that, having just read the book, I am sitting on my couch, sobbing, just totally impacted by the experience of connecting with Alexa and Jamison through their love story. “This is a totally unexpected love story. She’s an “Amazon” in heels and he’s an Italian “imp” all in black. But in her flats, she looks in his eyes, and he looks into her soul, and absolutely unbelievable magic happens. “Her Reluctant Bodyguard is an amazing, compelling story about love, but most of all faith…faith in one’s self, faith in others and faith in God. “That Alexa and Jamison will end up together never feels preordained, which is something that is difficult to achieve in a romance novel. Alexa is Miss Optimistic, as her sounding-board sister calls her, sure that her dream man is out there, and hoping that he might just be a famous pop-star! 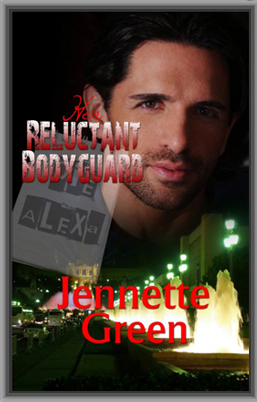 Jamison is jaded by his experiences with groupies and with beautiful women who love to toy with men’s emotions. …As their attraction grows, so does the hostility, since neither wishes to fall for the other, and potentially suffer heartbreak. Why hadn’t she tried to escape? Why had she let that happen? Because she wanted to know what his kiss would feel like. Now she knew, and it disturbed her. It was just an experiment, she told herself. Like seeing if her tongue would stick to a frozen flagpole in the dead of winter. A dare she had unfortunately accepted as a child. Neither, she determined now, was an experience she intended to repeat. IT CAN’T BE. Not possibly! Alexa peered through a doorway, trying to catch a better glimpse of the man on the Today Show set. He perched on a stool, opposite the pixie-faced co-host of the show. The object of her speculation wore a steel gray suit that emphasized his lean elegance. This was no good. He faced away from her. Silently, Alexa skulked across the set, hoping no one would notice her. Unfortunately, a broad-shouldered, muscular man in black came toward her, but she struggled to ignore him. He was so short that she could easily see over him in her three-inch heels. She sidled sideways, wanting to get a better look. It was Colin Radcliffe, international pop star! Alexa’s heart fluttered. She loved his songs, and the sound of his voice. And to think, he was being interviewed on the same day she was. “Ma’am.” The low voice commanded her attention, but she didn’t want to listen. What if she pretended not to hear? After all, just one more step and she would be able to see Colin’s face clearly. Impulsively, she edged closer. The man in black closed within four feet of her. Now the sheer physical force of his presence stopped her. In fact, she fought an overwhelming desire to retreat. He would let her get no closer to the star. Disappointment arose. She had just wanted to look. After all, she wasn’t a salivating, rabid fan. Or was she? Now a man with ‘Security’ written across his jacket appeared from her left, grabbing her attention. “Miss,” he whispered. “We’re taping. Wait over there.” He pointed. “I’m so sorry.” Embarrassed, Alexa quickly obeyed. Obviously, she had breached a security code. What had she been thinking? Her impulsive nature had again taken her down the wrong path. Colin’s interview quickly ended. With sorrow, she watched him disappear from the set. Her dreams of accidentally bumping into him and maybe getting his autograph disappeared in smoke. “Ma’am. Your turn.” A young man beckoned to her. She was led to a couch, and a man took the place of the pixyish woman. Heart thundering, Alexa smoothed her pencil slim skirt and fiddled with her cross necklace, making sure the clasp wasn’t halfway down her throat. A technician tucked Alexa’s auburn hair behind one shoulder. Alexa’s mouth went dry, facing the black eyes of the cameras. She had been interviewed on national television three times, and this would be the last. Her book tour was almost complete, about which she had mixed feelings. Her fifteen minutes of fame were almost over. What next, a small part of her wondered. Is this it? At twenty-nine, the peak of my career—my life? It was a strange thing to wonder when she was about to go on national television, and maybe push her fame out to sixteen minutes. A red light glowed on the camera. “Good morning…” began the co-host, and perspiration dampened Alexa’s skin. She was on live television. Millions of eyes were watching her. Her. But viewers were interested in Priscilla’s life, she reminded herself. Not hers. She drew a calming breath. “Yes. Priscilla and I became best friends in kindergarten….” A faint tremor seized her hands, as was usual whenever she was in front of any group of people—let alone millions—but it didn’t show up in her voice, thank goodness. The man smoothly led her through the list of questions about Priscilla’s problems with dyslexia and her refusal to concentrate in school. An unhappy, unsettled home life hadn’t helped matters. In fact, although Alexa didn’t mention it to the interviewer, it was the common bond that had knit Alexa and Priscilla together from the start. It was also one of the reasons why their friendship had survived each of their difficult high school years. Alexa delved into the familiar, publicly known part of the story. Her friend’s life had down-spiraled in high school when she had become addicted to drugs. By her senior year, most of Priscilla’s old friends and teachers had abandoned her; all except for Alexa and their home economics teacher, who had discovered Priscilla’s discerning palate and aptitude for creating outlandish, delicious entrées. Halfway through recounting Priscilla’s unlikely rise to fame by winning a reality cooking show, Alexa remembered to smile at the glowing camera. She even remembered an anecdote her publicist had advised her to include. When the co-anchorman chuckled, a warm glow filled her. At the first opportunity, she left the set, feeling relieved it was over. “Excellent interview.” The cultured English voice came from her left. His blue eyes sparkled down at her and Alexa’s heart skipped. He was much better looking in person than on the cover of a CD. His blond hair was perfectly cut, accenting the sharp, almost gaunt angles of his face. And he was at least six foot two. Munchkins? Why did her mouth have to outrun her brain now, of all times? “No. Of course not,” she said, feeling even more uncomfortable with her thoughtless words. Plenty of short men were running around. In fact, one stood just behind Colin, standing solidly beside a linebacker with blond hair. Both were unassuming. In fact, she would have overlooked them both, if not for guilt for her prejudicial comment. This particular short man might be five foot six. Maybe five foot seven if he stretched. If one discounted his square, uncompromising jaw, he looked a cross between a popular germophobe on cable and a dark-haired elf she had just seen in an old movie, and he wore all black. In fact, was this the man who had warned her away from the set? Uncomfortably, she stared at him, wondering. She had never actually looked at his face. He returned her stare, his dark eyes cool and unfriendly. It must be the same man. The powerful, warning vibe she had felt before smoldered now, tightly leashed. A little unnerved, she glanced sideways. The first man stood, shoulder to arm, beside the gigantic man with spiky blond hair. That one was certainly tall—maybe even six foot six—but she wasn’t necessarily attracted to men with tree trunks for legs and shoulders the size of Texas, either. What a pair! “Well, no,” she agreed, and shut her mouth. Colin did not need to know her long—unnaturally so, according to her sister—list of criteria she used to narrow down dating material. Number one was the men she dated had to be at least six foot one, so she could wear heels if she wanted to. Maybe that was horribly superficial, but she didn’t like the idea of towering over a man. This pop star, however, was perfect. At least six foot two. She flushed then, at her thoughts. Alexa stared after him, transfixed by a mixture of wonder and disbelief. Had her favorite pop star truly just asked her to lunch? This time she did pinch herself. It smarted. Alexa paced the luxurious lobby of the Michelangelo at 12:20 P.M. She loved the warm ambience of the elegant hotel. The soft, warm orange and gold colors made her feel welcome, and so had all of the staff, even though she sensed the hotel was geared to a pricier clientele than she. She had found it on an internet special. Alexa still was barely able to believe that Colin Radcliffe had asked her on a lunch date. Why had he? More importantly—would he truly come? “Yes.” Heart thumping faster, she followed him through the double set of doors into New York’s chilly March afternoon. He opened the back door and there was Colin. Pulse beating rapidly, she slid in next to him. “Hi,” she said with a grin. “Take us to the Serafina,” he told the driver. The short distance to the restaurant was accomplished slowly. The driver drove aggressively, but repeatedly slowed and swerved for weaving bicycles and brash pedestrians crossing against the light. “I’m glad I’m not driving,” Alexa murmured. Colin smiled at her. His eyes were as bright blue as before. She couldn’t get over their clear color. Periwinkle, she decided. Inside, the waiter ushered them to a table at the back of the restaurant. Alexa sat with her back to a wooden casing against the wall, while Colin sat across from her. On the white wall to her right, beyond a low wooden barrier and another set of tables, flickered a silent, black and white movie. Italian, by the look of it. Alexa perused the menu. Choosing would be difficult, for Italian food was her favorite. Not only that, it was difficult to concentrate. Just sitting here with Colin was so exciting. Her gaze kept dancing from Colin to the flickering images on the adjacent wall. And then she saw them. The two men from the television studio. The tall man and the short one—Mutt and Jeff, like the old comic strip characters. Had they somehow followed Colin? Were they the rabid fans? Apprehension sped up her pulse. The suspicious duo sat at a small table pushed flush with the movie wall. Both had a perfect view of her table. Of Colin. In fact, both kept glancing at the famous pop star. “Who are they?” She sent them another suspicious glance. The blond one gave her a faint smile, but the dark-haired one did not. In fact, he radiated antagonism. “My bodyguards,” he said simply, as if this were a normal occurrence. Well, of course it was, for him. “Me? Why?” Feeling ill at ease, she took a sip of water. Would You Like to Buy Your Own Copy?